This guide provides instructions on how to install and configure Red Hat CloudForms on a Red Hat OpenStack Platform environment. Red Hat CloudForms is able to be installed and ready to configure in a few quick steps. After downloading Red Hat CloudForms as a virtual machine image template from the Red Hat Customer Portal, the installation process takes you through the steps of uploading the appliance to a supported virtualization or cloud provider. After installing the Red Hat CloudForms appliance, you must configure the database for Red Hat CloudForms. See Section 2.3, “Configuring a Database for Red Hat CloudForms”. Click Red Hat CloudForms to access the product download page. The latest version of each download displays by default. From the list of installers and images under Product Software, choose OpenStack Virtual Appliance option with the latest version and click Download Now. Log in to your OpenStack dashboard to upload your Red Hat CloudForms appliance. In the Project tab, navigate to Compute → Images. You have successfully uploaded the Red Hat CloudForms appliance. From the OpenStack dashboard, navigate to Project → Compute → Access & Security. Navigate to Security Groups → Manage Rules on the row for the default security group. Select Rule → Custom TCP Rule. A flavor is a resource allocation profile that specifies, for example, how many virtual CPUs and how much RAM can be allocated to an instance. You can, for example, run Red Hat CloudForms on a Red Hat OpenStack m1.large flavor, which specifies a virtual machine with 4 cores, 8GB RAM, and 80GB disk space. Creating a flavor to run Red Hat CloudForms is optional. The following procedure demonstrates creating a flavor with the minimum requirements (4 cores, 8GB RAM, 44GB disk space) for Red Hat CloudForms. For more information about flavors, see the Red Hat OpenStack Platform Administration User Guide. In the Admin tab, navigate to System → Flavors. Configure the settings to define a flavor that meets Red Hat CloudForms system requirements. A new flavor specific to Red Hat CloudForms is created. From the OpenStack dashboard, navigate to Project → Compute → Instances. In the Project tab, navigate to Compute → Access & Security. Click Floating IPs → Allocate IP To Project. The Allocate Floating IP window is displayed. Although the Red Hat CloudForms appliance comes configured to be integrated immediately into your environment, you can make some changes to its configuration. The Red Hat CloudForms appliance is intended to have minimal configuration options. The following procedure describes how to make changes to the configuration settings on the Red Hat CloudForms appliance. The Red Hat CloudForms appliance console automatically logs out after five minutes of inactivity. 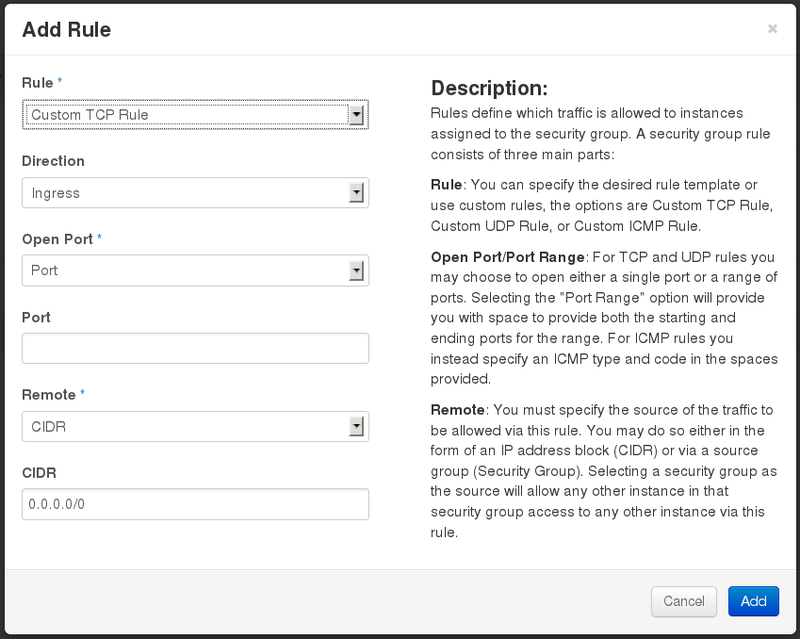 Use Set DHCP Network Configuration to use DHCP to obtain the IP address and network configuration for your Red Hat CloudForms appliance. The appliance is initially configured as a DHCP client with bridged networking. Use Set Static Network Configuration if you have a specific IP address and network settings you need to use for the Red Hat CloudForms appliance. Use Set Hostname to specify a hostname for the Red Hat CloudForms appliance. Use Set Timezone to configure the time zone for the Red Hat CloudForms appliance. Use Set Date and Time to configure the date and time for the Red Hat CloudForms appliance. Use Restart Appliance to restart the Red Hat CloudForms appliance. You can either restart the appliance and clear the logs or just restart the appliance. Use Summary Information to go back to the network summary screen for the Red Hat CloudForms appliance. Use Quit to leave the Red Hat CloudForms appliance console. Select 8) Configure Database from the menu. If this is not the first Red Hat CloudForms appliance, choose 2) Fetch key from remote machine to fetch the key from the first Red Hat CloudForms appliance. All Red Hat CloudForms appliances in a multi-region deployment must use the same key. Choose 1) Internal for the database location. Enter Y or N for Configure this server as a dedicated database instance? Select Y to configure the appliance only as a database. As a result, the appliance is configured as a basic PostgreSQL server, without a user interface. Red Hat CloudForms then configures the internal database. Red Hat CloudForms 4.x requires PostgreSQL version 9.4. If this is the first Red Hat CloudForms appliance, select the option to create a key. If this is not the first Red Hat CloudForms appliance, select the option to fetch the key from the first Red Hat CloudForms appliance. All Red Hat CloudForms appliances in a multi-region deployment must use the same key. Choose 2) External for the database location. You are prompted to create or fetch a security key. Select the option to fetch the key from the first Red Hat CloudForms appliance. All Red Hat CloudForms appliances in a multi-region deployment must use the same key.